THE BUGATTI PETROL-DRIVEN TRAIN, which has attained a speed of over 100 miles an hour on the lines of the Paris-Lyons-Mediterranean Railway of France. IT has fallen to France to play an important part in the development of the express rail-car, which, in its various forms, is rendering excellent service throughout the world. American streamlined trains are very light in construction and driven by electricity from current supplied by their own Diesel engines. These trains, with their amazing speeds of 100 miles an hour, have been evolved after much research and experiment. It is in this connexion that the rail-car has played so important a part - providing a fast, self-propelling vehicle for use on the railways and capable of being run at very low cost. The single coach has, in course of time, been extended to a train of two, three or several more cars. The various types in use on the French railways give an indication of the advance made not only in the improvement in this form of transport, but also in the evolution of special rail-cars for the differing traffic conditions on individual routes. In France Les Autorails, as they are known, are specially built for certain services. There are high-speed rail-cars with comfortable accommodation, which have been built for long distance travelling on the main lines. Others have been designed with powerful engines and large carrying capacity to serve as connecting links between important centres on the principal railway routes. Some types of rail-car are in service on branch lines to give greater facilities for fast travel. For tourists, the French railways have provided a special type of light rail-car, which offers an excellent view of the scenery along the line. The Bugatti petrol-driven trains of the French State railways are notable examples of the long-distance expresses. These run between Paris and Le Havre. During the summer months a service of Bugatti trains also runs between Paris and Deauville. On the Paris-Lyons-Mediterranean line also, the Bugatti trains are very interesting: air resistance has been reduced to a minimum by streamlining the body-work of the coaches. These PLM trains consist of a motor-coach to which is coupled a passenger car. Each is carried on two eight-wheeled bogies. The design of the bogies is ingenious and contains features not usually found in railway work of this nature. The bogie frames carry the main coach chassis by means of a central pivot consisting of a cylinder full of oil. This cylinder contains a piston - which enables the device to serve as a shock-absorber - as well as a bearing round which the bogie swings when negotiating curves. Easy running is further assured by heavy longitudinal springs, with which the two bogie supports are attached to the main bogie frames. Each support of the power bogie is joined by flat steel springs to the bearings of the carrying and driving axles respectively. The arrangement thus consists of two carrying wheels linked by springs to a pair of driving wheels, followed by another two driving wheels and their adjacent carrying wheels. The wheels are remarkable and consist of a “dished” centre with an internal brake drum similar to that in use on a motor-car. The wheel centre is bolted to a flanged steel rim, but between the two are placed rubber pads, which give a similar effect to rubber tyres. In some types of rail-car this idea has been carried a step farther, and pneumatic tyres are used for railway work. In such instances steel flanges are employed to keep the rail-car on the track, and rings inside the tyres guard against the danger of sudden deflation. All the thirty-two wheels of the train are fitted with brake drums, and the brakes are operated by air or by hand through a series of steel cables. The power plant consists of four Bugatti 8-cylinder engines, each developing 200 horse power at 2,500 revolutions a minute. A fuel tank is placed under each motor, and the engines run on a mixture of petrol, benzine and alcohol. The power plant is situated in the centre of the motor-coach, and transmission to the driving wheels is by cardan shaft, as in a motor-car. The engines work independently, and one, two, three or all four of them at once can be run as required. Each motor is provided with an electric starter and a radiator. The operating gear of the Bugatti trains is very simple, since the engines are controlled by the throttle. The chassis of each vehicle comprises two longitudinal girders of pressed steel joined together by cross-members. The body-work is made of aluminium, and is attached to the chassis by special fittings lined with rubber, which eliminate any vibration. The space between the two coaches is covered with a rubber curtain to preserve the streamline effect of the coachwork. The motor-coach consists of two compartments with space for thirty-six passengers, separated by a baggage room, a toilet room, and the engine compartment. The control position is unusual, since it is arranged with lookout windows that give a clear view over the roof of the train when running in either direction. In this control room the driver has the electric press-buttons to start or stop the motors, the throttle levers of each of the engines, and the handles for operating the air or hand brakes. An instrument board is also provided for recording the speed of the motors. The trailing car attached to the motor-coach has thirty-eight passenger seats arranged in two compartments and, in addition, there is another compartment for luggage, with a toilet room and a buffet kitchen, complete with a refrigerator and gas-cooking apparatus. The general arrangement of the compartment interiors resembles that of a Pullman car, with removable tables and large, upholstered armchairs. The floor of each coach is provided with a wide carpet, and a corridor connects one car with the other. Special air-conditioning apparatus is provided to ensure that a constant supply of fresh air is available at all times. In winter the air is warmed by passing it through the radiators of the engines. The electrical equipment of these rail-cars comprises a battery of alkali accumulators, which are charged by dynamos driven from the main transmission shaft. THE CONTROLS OF THE BUGATTI EXPRESS. In the foreground of this picture is the handle for operating the hand brakes. Immediately above this are the four levers that control the throttles of the engines. 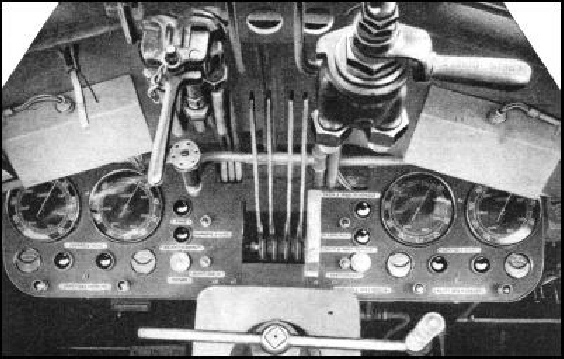 To the left of these levers are the push buttons of the warning bell and syren, and on the right is the control for the air brake. The four dials shown give the revolutions of the engines, and below these are the various electric controls for starting and stopping, together with others that regulate the oil supply and the lighting of the train. The Northern railways of France have some large and fast motor trains on the Lille and Paris route, each consisting of three coaches. The first coach has, at the front end, a motor compartment containing a 12-cylinder Diesel Maybach engine, developing 380 horsepower, driving an electric generator supplying current to the power motors on the driving bogies. The axles run in roller bearings. The braking arrangements on these trains comprise an oil-pneumatic system, together with an electro-magnetic reserve brake, while there is also a powerful hand brake. These trains, like the Bugattis, are built on steel chassis with metal body-work. The last coach of the train, which can be driven from either end, contains a motor similar to that in the first car. The first coach has seating accommodation for forty-one passengers and standing-room for three more. The second seats thirty-five people, and here again space is allotted for three standing travellers. There is also a buffet kitchen and a mail compartment, with a luggage-room in each of the cars. One of the most remarkable among the lighter type of rail-car is the “Micheline”, which has seating accommodation for thirty-six passengers, and can carry over half a ton of luggage. The chassis is of steel, with the body-work in aluminium. The coach is carried on two six-wheeled bogies, and the driver has a cabin with an outlook over the roof. The vehicle can be driven in either direction. The body-work, in common with that of most cars of this type, is streamlined. The engine is a 52 horse-power Hispano with 12 cylinders. Each of the twelve wheels of the coach is provided with a brake drum, so that the car can be pulled up in 150 yards even when travelling at 50 miles an hour. Micheline rail-cars have a top speed of over sixty miles an hour, and run on pneumatic tyres fitted with steel flanges to keep the coach on the track. A large number of these cars are running on the lines of the French State railways in the neighbour-hood of Granville, Le Mans, Saint Brieuc, Rouen and Brest. Others of this type are to be found on the French Northern lines near Lille, and on the Paris-Orleans-Midi route between Vierzon and Montluçon. THE MICHELINE motor-coach, many of which are in service on the French State railways, is illustrated above. This coach can be driven in either direction, and the motorman's control cabin has an outlook over the roof, similar to that on the Bugatti expresses. These coaches run at over 60 miles an hour on pneumatic tyres fitted with steel flanges. Another rail-car similar to the “Micheline”, except for the tyres, is the light weight “Renault”, which seats forty-two passengers, and is driven by a Diesel-Renault engine with 12 cylinders, developing 250 horse-power. This car can be driven in either direction and is designed for a maximum speed of 60 miles an hour. The Renault cars operate on the French State railways near La Rochelle, Nantes, Rennes, Le Mans, Cherbourg and Lisieux. For service on the Paris-Caen route, a two-coach articulated train has been built with a motor at each end, driving direct to four-wheeled bogies. The cars are hinged together at the ends opposite to the motors, and rest on a four-wheeled bogie common to both. The power units are Diesel-Renault 12-cylinder engines of 270 horse-power, giving a top speed of 75 miles an hour. These trains carry eighty-five passengers, in addition to luggage. The coach-work is streamlined, and the train can be driven from either end. The braking system comprises a powerful air brake which works in conjunction with an electro-magnetic braking system. THE RENAULT eight-wheeled motor-coach, running on the lines of the French State railways in the neighbourhood of La Rochelle, Nantes, Rennes, Le Mans, Cherbourg and Lisieux. These coaches run at speeds varying between 56 and 70 miles an hour. Many fine speed records stand to the credit of the French rail-cars. A Bugatti express of the type operating between Paris and Deauville and on the Paris-Havre route, has on test achieved a speed of 120 miles an hour. These trains display a remarkable stability when rounding curves. It has been suggested that the rail-cars, with their high speeds, may be regarded as serious rivals to the air liners on the main passenger routes. This does not seem improbable, since aerodromes are often at a considerable distance from the towns which they serve, whereas the railway stations are situated centrally. Speed was not, however, the only consideration of the French engineers when they were designing their rail-cars. A high standard of comfort has been attained by careful attention to air conditioning so that the draughts so often associated with fast railway travel have been eliminated. THIS IMPOSING STREAMLINED EXPRESS has a speed of over 80 miles an hour, and runs on the Northern Railways of France between Lille and Paris. The train is electrically driven, current being supplied by the generators of two 12-cylindered Diesel-Maybach engines. Accommodation is provided for 144 passengers. The expedient of warming the air supply to the coaches by means of the engine radiators has also proved successful. Another feature that has greatly contributed to comfortable travel in these trains is the employment, where-ever practicable, of rubber for insulating purposes. The body of the coach is attached to the chassis by means of rubber-lined brackets so that no vibration is transmitted from the track to the passengers. The steel tyres of the wheels also are cushioned to prevent vibration. THE RENAULT STREAMLINED EXPRESS, operating on the Paris-Caen route, has a speed of 80 miles an hour, and is driven by two Diesel-Renault motors. This train, comprising two articulated cars, can be driven from either end, and has seats for 85 people. You can read more on “British Diesel Rail Coaches”, “Rail-Cars on Rubber Tyres”, and the “Union Pacific Streamlined Express” in Railway Wonders of the World.